Using text messageing and for the ancient and mystical art of talking to heavens. 1. Think of a message that you would like to send out into the universe. It could a question, a secret, a dream, confession, a wish or anything at all. 2. 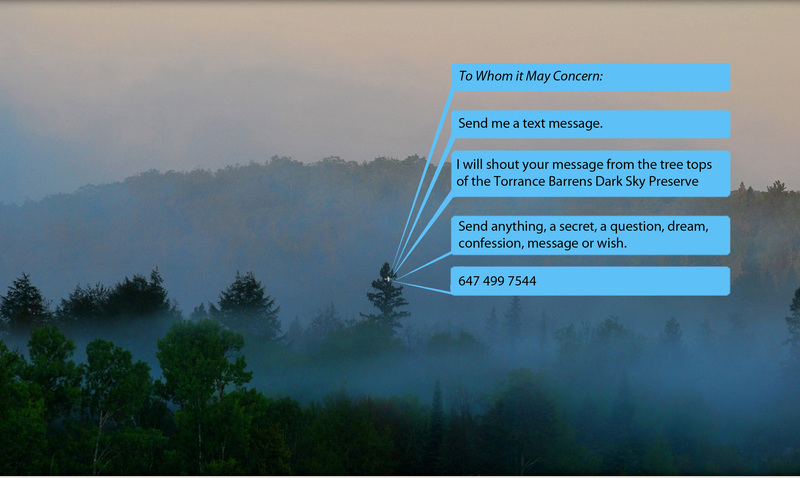 Text your message to 647 499 7544, sometime during the night of October 5th, any time from sunset to sunrise. 3. 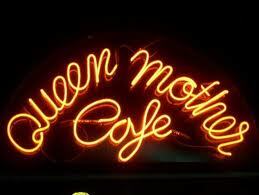 Visit the the back patio at the Queen Mother Cafe during the night on October 5th to see the project in action. Watch the live video feed of from the Torrance Barrens Dark Sky Preserve, and listen to the messages as they are called out to the moon and stars. The Torrance Barrens Conservation Reserve consists of 1990 hectares (about 5000 acres) of crown land south-east of Bala, which is administered by the Province of Ontario. The first of its kind in Canada, the Torrance Barrens is now officially recognized as a "Dark Sky Reserve." The geology of the landscape is characterized by low ridges of Precambrian Shield, which was formed approximately 2.5 billion years ago. The rich variety of vegetation, the geology and the large size of the Barrens have resulted in a diversity of plants and animals, including some provincially and nationally rare species such as the Southern Bog Lemming and the elusive Five Lined Skink, Ontario's only lizard. One might also find the threatened Eastern Massasauga Rattlesnake, the uncommon Eastern Hog nose Snake and several species of birds and mammals that are at the northern limit of their distribution. The area is home to many erratics–large boulders that were dropped off by receding glaciers. The troughs between the rock ridges are filled with wetlands and small ponds and lakes. The wetlands are diverse, with dense open-water marshes, peat lands, grassy bog mats, floating shrub mats and swamps dominated by mature conifer trees or shrub thickets. Beavers are active in many wetlands. The lunar landscape of the Barrens is characterized by low ridges of Precambrian bedrock, separated by wetlands and peat-filled hollows, scattered boulders and even a little soil. The prevalence of bare bedrock is the direct result of wave-washing by the receding waters of the ancient, glacial, Algonquin Lake and Nipissing Lake. The nationally-rare Eastern Bluebird and Cooper’s Hawk can often be spotted on the Barrens and the elusive Wippoorwill and Nighthawk can be heard in late evening. Many diverse vegetative species grow here. The Eastern Massasauga Rattlesnake–a threatened species–can also on occasion be found here, as can Ontario’s only lizard, the Five Lined Skink. 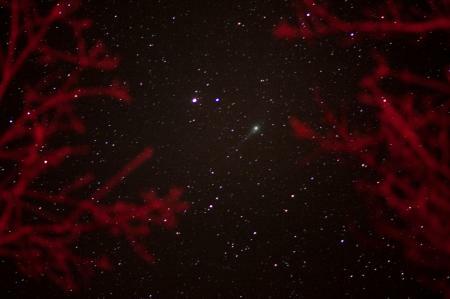 Amateur astronomers have identified the Barrens as an ideal place to view the night skies with little light infiltration from urban areas. Once the Conservation Reserve was established, naturalists realized that the Torrance Barrens had a previously unrecognized attribute. Because of an absence of light pollution at night, it was a remarkable place to view the natural beauty of the starry sky. Protected or undeveloped land virtually surrounds the Reserve, acting as an additional buffer from urban lighting. This combination of attributes makes the Barrens unique in Ontario. In 1999, the Ontario government acknowledged night-sky viewing as an important use of the Torrance Barrens and added the designation of Dark Sky Reserve to its title. The announcement received national and international attention. This is indeed a special place to view the universe. The metamorphosed rock is more than two billion years old. It has been under mountains, under water, under miles of ice and under tropical jungles many times in its history. Today, it is under your feet as you look up into the cosmos and appreciate the immensity of time and space. To claim this find, place yourself at the posted coordinates and identify the glacial feature you can see both north and to the south. The dark sky designation was a project was developed by Muskoka Heritage Foundation director Peter Goering in partnership with the Ministry of Natural Resources, with support from the Township of Muskoka Lakes Ratepayers Association and the Township of Muskoka Lakes. The growing awareness of light pollution of the night sky and the inability of large sectors of the population to experience and enjoy astronomical events has created a demand for an area where the dark sky can be preserved. A combination of ancient rock outcrops, peaceful wilderness and rare plants and wildlife makes Muskoka’s Torrance Barrens a unique Conservation Reserve. In 1999, the Barrens’ nighttime star-filled darkness was designated by the Ontario government as the world’s first permanent Dark Sky Reserve – a move that recognized the region as a protected space free from intrusion by urban light pollution. Few natural vistas can match the inspirational panorama of the Milky Way-our home galaxy-arching overhead on a cool, clear summer or early-autumn evening. At the Torrance Barrens, the ancient constellation and planets shine forth in majestic profusion. On occasion, the northern lights (aurora Borealis) are visible – often as greenish wisps but sometimes as spectacular curtains of colour. In binoculars, rivers of stars that are completely invisible to the naked eye flow into view. Rich star clusters, wispy nebulas, the cloud banks of Jupiter and the rings of Saturn are all visible with a beginner’s telescope. From the tops of the trees in The Torrance Barrens Dark Sky Preserve, I will act as a messenger to the Universe. You are invited to use me as a conduit to send your words into the night sky and whoever might be listening above. Text a message to 647 499 7544 and I will call it out from his place in the treetops. As many messages, secrets, dreams, questions, confessions, and wishes as possible will be read out during the 12 hours of Nuit Blanche. A live broadcast will be sent from the park to the Queen Mother Cafe. From there you can see the video feed from the dark sky presernce, hear the words as I cry them out, and read the texts as they come in from around the city. To Whom It May Concern uses current technology for a magical and ancient purpose. 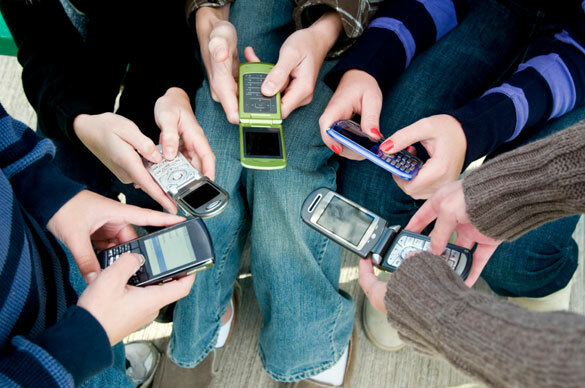 Can we repurpose our devices to bring us closer to the nature?